This is part 3 in a 5-part series about my computer chronicles, right from the beginning of the 80’s to the end of the 90’s. I’ll go into details about the computers I used, how I got into the C64 demo scene, created my music players and editors, and the experiences I had on the way until the turn of the millennium. My swapping friend Kim knew a mate from school that was a member of the Amiga group Channel 42, and soon I had also established connections with them. Although they were strictly demo coders on Amiga, they respected what the C64 could do. In fact, both Niels and Morten were both very easy going and observant, often pointing out the little details in demos on both computers. Morten would later turn out to be a skilled programmer, coding games on Amiga and consoles, while Niels was a graphics artist that knew how to draw inviting cartoon characters. They themselves broadened my connections further as they too knew a lot of other fellow wizards. Niels and Morten would also later be important as they got involved in computer games for Danish television. More about that later in this part. Niels in my room, probably around 1991. He later founded Krogh Mortensen Animation in 1997. Kim, Scorpio and I created a C64 division of Channel 42 and I left Dominators to join it. Niels even created a few logos for C64 intros coded by Scorpio. Towards the end of March 1989, I went to the Ikari & Zargon party in Slagelse. I had just converted a pop hit by Sandra to my NewPlayer on C64 and it was used in a demo by Ikari. This was a shared Amiga and C64 party, and the Channel 42 guys introduced me to Jesper Kyd. He was still learning the ropes at this point, but I noticed that he shared the same penchant for being observant and eager to learn when listening to MOD tunes on Amiga. He got hold of a new one at the party and it was interesting to see the way he immediately zoned in listening to it, concentrating intensely on how it was composed. Jesper Kyd would later evolve his musical skills into composing professional music for a lot of video games such as the Hitman, Assassin’s Creed and Borderlands series, but I never got to know him personally. In fact, I think I only met him this once at the Slagelse party. The conversion of “Secret Land” by Sandra that I made for the Ikari demo. But naturally, I was of course mostly interested in the C64 hall at the party. Cheyens was there and I had a talk with Link several times. Supposedly the German C64 composer Markus Schneider should also have been there and I actually tried looking for him, but I never had the honor of meeting him. And once again, I spotted that interesting guy with the thick, dark brown hair sitting by his C64 on a balcony, overlooking the hall. JO of Amok. Again he seemed reserved and I kept my distance. Or perhaps I was just too busy talking to all the mates I now knew at this party. Klaus Grøngaard (Link of Cheyens) at the Dexion X-Mas Conference in December 1990. Brian and his friends had joined Ikari, and they were of course present as part of the organizer team. Their demo won a shared first place in the C64 demo competition together with Channel 42. However, both demo groups were represented among the team of judges and it really felt anything but fair. Even I, who had a new tune in Ikari’s demo and was part of Channel 42, could see that. I’m ashamed to admit that I can’t remember how I eventually did get to know JO of Amok, but it must have been shortly after the party. His first name was Jesper and he was almost obsessed with coding efficient music players. He also composed music in them, albeit always using the assembler listing method. He never really got around to finishing an editor. The following years I had a lot of competent feedback on player techniques. It was Jesper who first made me aware of the technique known as hard restart. It had previously been used by Rob Hubbard and also Laxity had figured it out. The technique involved the ADSR of a voice, which defines the course of volume changes during the life of a note. Due to how the SID chip was engineered, triggering a new note would sometimes start the ADSR in a faulty manner, interpreting the volume differently. It was subtle, but enough to make the listening experience more rough. 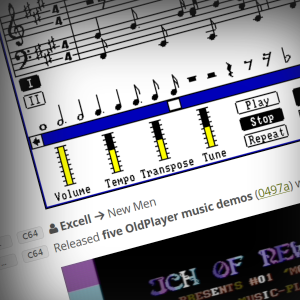 A music player was typically called once for each time the monitor refreshed its image, which was 50 frames a second for us PAL users in Europe. The hard restart technique solved the inaccuracy of the ADSR by putting zero values in the registers during the last two frames of the lifetime of a note. It made the notes sound slightly staccato, but the ADSR would be rock solid. In fact, the technique made the ADSR so solid that short volume attacks would now sound almost like sort of a click. Jesper was great at technicalities like this and was constantly coding on a player. And not only on the C64. Where I had a tendency to prefer the C64 only and update my editor as well, Jesper also learned how to code a player on the Amiga – both using samples and emulated pulsating. It was a great as that meant that we could now deliver on other formats for a game. But Johannes was actually also on the frontier when it came to cutting edge music player coding. It was while Johannes was visiting me that he discovered how to use a test bit in the SID chip to reset the random numbers used internally by the noise waveform. Resetting the numbers like this made the noise sound more predictable each time a note was played, giving it a slightly more metallic sound. Johannes also tried to improve his already excellent player to use only 12 rasterlines of CPU time, but it kept bumping up to 13 rasterlines no matter what he tried. “Well – I guess there are limits to everything”, he finally concluded and accepted defeat. Jesper and Johannes also knew each other and shared knowledge, but Jesper’s relationship with him was even more forced than mine. It was clear that Jesper had an enormous respect for Johannes. Even when Johannes was not present, he was often talking about what he or they had done recently. It was understandable as I had a smattering of it too, at least to begin with. I sometimes wondered how much Johannes was aware of this. Retrospectively, you could say that we had our separate strengths on the C64. Jesper was probably the technically most adept player coder. I had an awesome music editor. And Johannes was by far the best C64 composer. He was definitely in the top ten worldwide. A bit further north from where I lived already north of Copenhagen, two teenagers had decided to code a new shoot’em up for C64. Tecnetium. They were not in the scene at all, but somehow they had still managed to get in touch with me. I agreed to make the music and SFX and I tried my best at the time, making a really long title tune. Let’s just say it was one of those that Johannes didn’t have any comments for. But time passed by, and I heard nothing from the duo. I then called them and they were very apologetic. They had lost all interest in the game and eventually just stopped coding. I was of course disappointed, but what was even worse was that this would only be the beginning of repeated incidents. Many more canceled games awaited. Johannes wisely recommended to me at that point, “Don’t make music for private people, it usually goes nowhere.” It made a lot of sense, but getting jobs for game companies would turn out to be very hard for a guy like me that had no talent for business. I had to take my chances when they presented themselves, sparse as I knew they might be. Right from the beginning I was protective of my music editor on the C64. I didn’t want it to be spread around and just become another common editor, eventually turning it into a humdrum sound everybody was sick of. I had already seen what that had done to the likes of SoundMonitor and Future Composer. Maybe it would even be possible to sell it later? I wasn’t sure if that was even possible, but I always kept it in the back of my head. But at the same time, I was usually very honored when someone actually asked for my editor, and if it was someone I knew was into music and generally seemed like a nice guy, I would usually give them my editor. As spring of 1989 passed by, I had already given my editor to about half a dozen people. I kept strict note of the users and even added a code to each individual copy, sort of like a stamp of ownership. At that point, the most noteworthy users were Link, Scorpio and Scarzix. But as the summer of 1989 crept closer, I started noticing remarkable music from a new kid in Denmark. This time it wasn’t a coder that was about to overtake me just like Laxity had done. He just made music, and because of this his only options were SoundMonitor and Future Composer. But even though he used editors that were commonly available, he still caught my attention for several reasons. At that point his music was relatively simple, but it still contained proof of talent. The basslines were vivid and I also liked the consistent use of chords. Another interesting detail was that the bass and drum instruments were changed to entirely new kind of sounds, something virtually no one bothered to do in these editors. This made the music player less recognizable and also demonstrated that the kid was willing to go far to get the sound he really wanted. A tune Drax made in SoundMonitor in 1988. I soon learned the name of this kid. Yet another Thomas, using Drax as his handle on the C64. He was just 13 years and lived in Arden, in the opposite side of Denmark. Way too far for us to just meet directly on a whim. Eventually I called him up. Drax was awestruck that a famous C64 musician like me was calling him. He was a fast talker and you could almost feel how eager he was to learn and hear everything related to C64 music. We talked for hours the first time, including playing a lot of C64 music through the phone. In the end I could actually sense Drax almost falling asleep, refusing to let go. It was clear to me that he should definitely have a go at my music editor. Luckily another copy-party was coming up in the end of June, this time held by 2000 A.D. in the town of Esbjerg, on the western coast of Denmark. It was one of the smaller parties. Link was also present and we met Drax. He was a tall kid that didn’t give the impression of being just 13 years old. He felt older than that. Drax was all over the editor right from the moment we arrived, and both Link and I showed him the ropes in it. He immediately loved it. At the party itself I also met another Jesper (a good coder better known as Trap) and I got quite unexpected praise from a tough looking dude that really liked the conversion I had made of the title tune for Maniac Mansion. My recreation of the primitive title tune with much better instruments. After the party, Drax would soon start using my music editor intensively, to a degree that would leave most other composers breathless. He produced tunes like an assembly line, sometimes to kill boredom (usually these tunes would resemble each other) but sometimes also really trying to push the envelope. He was learning and improving with a drive and speed I haven’t seen repeated anywhere else in the entire demo scene. It was almost like he was running on a supercharged battery. Throughout the remainder of the 80’s and the beginning of the 90’s, he managed to produce almost a thousand C64 tunes. He was fond of the funky bassline and almost always used a lot of chords, both of which became important trademarks of the type of music he produced. Drax playing around with a cheap keyboard at my place. Probably 1990, give or take a year. Drax frequently called me and we always had such long phone conversations, and not just about C64 and chiptunes. But if he got wind of me having made a new C64 tune, he would immediately ask that I played it through the phone. He also visited me a few times and he even composed a few songs there. One thing I especially noticed regarding his technique was that he often changed the general pitch of the entire piece up or down as part of the editing process, to test whether the music had a better sound there. I never did that myself but maybe I should have. My music always stayed at the pitch I started it at, as if it was set in stone. But Drax actually had a lot of ideas about composing songs that made a lot of sense. He also talked about using the chords to improve the fullness of a song. A lot of my earlier songs didn’t even have chords – it was just a leader and a bass. Drax also had a close friend, Torben, who was known as Metal. He made music much in the same style as Drax, and he too received my music editor. Together they made the music group Unitech Designs and initially made tunes for the demo group Nato. In August 1989, I made a tune that was processed twice as fast, to hear how much arpeggios and instruments would be improved by this. To my knowledge, only the game developer Antony Crowther had tried something similar at this point, in the game Zig Zag. It was an interesting experiment, but I felt that it didn’t yield enough advantages compared to eating up twice as much CPU power. I was also disappointed that no matter how many times I called the player within a frame, arpeggio chords never reached a point where they would truly sound like individual channels. They just got uglier. An English game developer that coded many excellent C64 games, such as Blagger, Loco, Potty Pigeon and Suicide Express. His trademark was a good use of smooth scrolling at a time where many other C64 programmers were still struggling with this. Antony Crowther later teamed up with the C64 composer Ben Daglish to form a duo that matched the quality and style of Rob Hubbard’s music. The tune where the player is called twice as fast. There are interesting changes at 1:16 and 2:02. Later I would code quick players that was customized to being called several times a frame, logically using less time for subsequent calls since the note data only needed to be processed the first time. But even so I still didn’t use them much myself. Creating instruments such as drum sounds seemed to require a new kind of thinking when writing tables of waveforms, and I decided that I didn’t want to spend too much time with this when it would also be more difficult to use in games and demos. Besides, players called the normal 50 times a second had a recognizable charm I liked. However, one of my later C64 music friends, Morten (MSK), loved the sound it created and made a lot of tunes this way. I was just content that someone else found a use for them. In the meantime, the Dutch duo Jeroen Tel and Charles Deenen had formed a music group with the name Maniacs of Noise. Both were composers, but especially Jeroen Tel was a virtuoso. Remember that top ten I was talking about earlier, the one I said Johannes was part of? Jeroen Tel was most certainly on it too. Charles Deenen had a few good tunes as well, but he was very critical of himself and preferred to make sound effects and also handle the business side of getting their stuff into games. Luckily he was excellent at both, and together they were an amazing team that had a lot of success in C64 games. Laxity, Jeroen Tel and Drax. Laxity and Drax also joined Maniacs of Noise later. Several C64 composers in the demo scene were of course jealous of this and dreamed of reaching the same level. They too invented music groups, some even using the same “of”-word in the middle. I immediately decided that creating a music group was a silly idea that would only make me feel like a copycat. I just wanted to keep using my handle, JCH. But then, as the PCW show in London approached and it was decided that I would go there to try and sell our music, Link called me up one evening. He firmly believed that if I was to go over there and try to sell our music, we needed to have a group name to have a better chance at competing with the likes of Maniacs of Noise. I refused to begin with, but Link managed to change my mind. I could see it made sense. Then the same phone call became a brainstorming session where we tried to figure out a good name. We quickly agreed that using “of” as a middle word was completely out of the question. So “Dudes of Volume” was out. After a while I came up with “Audio Ants”, but it was missing something. I then thought of vibrato – the effect that cause tones to wave the frequency – why not try to combine that with “Ants” from the previous suggestion? I said the word “Vibrants” almost as a test to hear what it sounded like out loud. “Yeah – that’s good,” Link immediately commented. And so it was decided. JCH and Link would be known as Vibrants. The Vibrants logo made for the Amiga/DOS game Lollypop. The group name would become popular in the demo scene for years and gain more members. Drax was of course the third to join. One thing I’ve actually never revealed to anyone was how I disliked demo groups referring to us as The Vibrants. There was never supposed to be a “The” in front. It was just Vibrants. In the end of September 1989, I went to the PCW show in London together with Brian and his Ikari friends. We visited some of their English group members. The show itself was the typical computer fair with lots of company booths. I had prepared a couple of demos on a batch of floppy diskettes with music by Link and I, and I tried to pass them on to eight companies I knew were making C64 games. It was surprisingly difficult. Here I was, looking like a nerd and with no sense of business, trying to talk the talk. It probably didn’t help that I wasn’t really all that confident either. Most of them dismissed me before I had a chance to do anything. Others took the disk and presumably threw it in the trash can as soon as I turned my back to them. Only one of the them actually got curious enough to load the demos and have a look, but even that didn’t yield any game jobs at all. It was pretty much futile, and I didn’t even get to see London either. The sad thing about my time as a composer on the C64 these years was the duality I felt about it. I was soon incredibly popular in the demo scene. Known by everyone and often in top of the floppy magazine charts. Had a lot of music in demos together with my mates in Vibrants. In that regard it was the ultimate success. However, that wasn’t the condition I was measuring this by. What I really wanted was to get my music on C64 games. Money was part of it of course, but most of all, I dreamed of getting the same respect by C64 reviewers as Rob Hubbard and Maniacs of Noise once had. I tried repeatedly to get my music on games. I later had some success with Danish games and later a few obscure English ones, but mostly I made for the private people that Johannes had warned me against. It never took off the way I imagined it could have. That always felt like some kind of shortcoming, a wasted opportunity. In fact, it may very well have been part of the reason why I fled to the PC instead in 1991-92. By that time, most of the game companies had started losing interest in the C64 – and thus so did I. Today, I know I was thinking of this the wrong way. The demo scene on the C64 really was awesome and I’m happy that I was once a significant part of it. And a fine example of how great it could be even appeared in the end of December 1989. Dominators, Upfront and Trilogy arranged a copy-party in Randers, and it became probably the best computer party I’ve ever been at. It was a cozy location at a school, I met a lot of prominent guys from the scene, and Vibrants had several tunes in the Bones demo that eventually won the C64 demo competition. Apart from Drax and Link, I also met Moppe, Zizyphus, Omega Supreme, Steel, Laxity, and Zenox. Even Johannes Bjerregaard and the Dutch music group 20CC were present. Johannes tried to make C64 music in an assembler listing at one point, and I noticed how he was beating the time for it. I wished I could do that too. 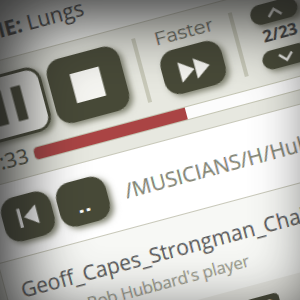 Edwin van Santen watched while Drax and I was messing around in my music editor, and he mentioned something in the line that 20CC also ought to make themselves a music editor. The Dutch coders and composer Falco Paul and Edwin van Santen formed 20th Century Composers in June 1988 as one of many groups mimicking Maniacs of Noise, just as we eventually did with Vibrants. 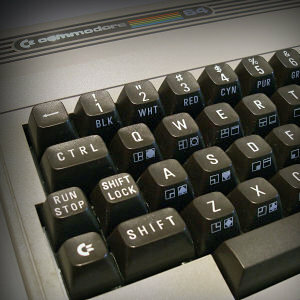 One of their most famous C64 songs was the conversion of “Layla” by Eric Clapton. The C64 hit converted by Edwin van Santen. One guy who probably had mixed feelings about the Randers party was that poor hot dog vendor just outside of the school. It’s was clear to see that he wasn’t used to that many customers lining up. I bet he gained both a lot of money as well as a lot of stress. Remember Niels and Morten, the Amiga duo from Channel 42? Together with some of their friends they started making a strange kind of video games for Danish television. It was a unique concept that was featured in a weekly evening show, the kind where interviewing guests were interspersed with various entertainment. One of these shows was a video game with a polar bear called OsWald. People would call up the host using the fixed line phone of the time and then press its tone buttons (DTMF) to move the character. The first game in 1988 was viewed from the top while scrolling downwards, and the player would have to jump on floes avoiding various dangers. Is was cutting edge and very successful. There was also a sequel in 1989 called Super OsWald where two players could play at the same time. 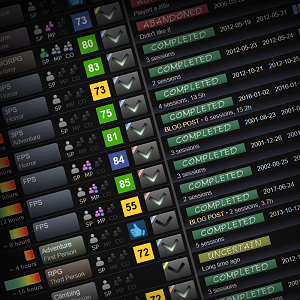 The Danish company, SilverRock Productions, then decided to launch versions of it for the popular home computers in Denmark. I got to make the title screen music and sound effects for the C64 version where Scorpio coded and Niels drew the graphics. It must have been around fall 1989. The title screen music I made for it was the second suggestion I had played for Niels and Scorpio through the phone. The first one was a disaster, but luckily the second one was excellent. Being the real-time editing amateur composer I actually was, I never quite had as much control over the quality as I wanted to. Sometimes it just turned out to be a turd no matter what I did, and at other times I magically caught lightning in a bottle. Those two suggestions were in each end of this spectrum. Good thing they made me try again. The final version that was used as the title tune for game. Check out the solo at 2:34. Because of the success of the OsWald games, SilverRock decided to up the ante and try the same television concept with an even more ambitious video game. This became Hugo, a small forest troll with a cute voice that typically spoke to the player calling in. Niels drew the Hugo character and achieved a bit of fame for it in Denmark. The first game, which was running on an Amiga just like the OsWald games, had Hugo running in 3D through a mine tunnel. Since this was only the late 1990, the 3D wasn’t done in real time. It was pre-rendered, but it looked very convincing as it moved towards Hugo. Again, people calling in would control him using the tone buttons on their fixed line phone, and again it became an enormous success on Danish television. In fact, the game started a franchise of video games that are still being produced today, albeit by a different company. The conversion I made of George Keller’s “Hugo Rap” for C64. Again, a C64 version was being produced and I converted a Danish rap hit as the title tune for it. Eventually a PC version was also made and that became my entry into the world of AdLib music. I made the SFX and also converted a congratulations tune that a musician had composed for the Amiga version. The PC version surprised everyone by looking almost as good as the Amiga version. People probably expected CGA or EGA quality graphics, but the PC coder, Kaare Siesing, was really up-to-date with what VGA could do. Question: CGA, EGA and VGA? These were early graphics modes that started out as display cards plugged into slots inside of the PC. Later display cards were of course backwards compatible. CGA (Color Graphics Adapter) was released in 1981 and could only display four colors in 320×200, or two colors in 640×200. 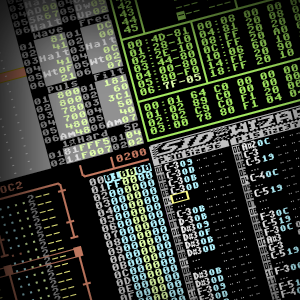 The first mode was most commonly used in games and often together with a hideous palette of cyan, magenta, black and white colors. EGA (Enhanced Graphics Adapter) was released in 1984 and could finally display 16 colors in similar resolutions, making it look more up to par with its contemporary home computer competitors such as e.g. the Sinclair ZX Spectrum and Commodore 64. VGA (Video Graphics Array) was released in 1987 and it is probably most famous for being able to display 256 colors in the 320×200 mode. It even had hardware smooth scrolling although I doubt this was used much in games. Also, you couldn’t split this up like you could on the C64. None of these cards had any sprites. SilverRock Productions also started making video games that didn’t have anything to do with the television concept. Advertising games. The first was Guldkorn Ekspressen in 1991, featuring the honey bear from the box of the popular Danish cereal. The honey bear would control a locomotive in a side-scrolling action game. I created loads of tunes and sound effects for the C64 version. Jesper had his Amiga player at the time and we converted my music to it pretty much the hard way. My title and hiscore tunes were not that amazing, but I still like some of the level tunes. They were made using two voices to make room for sound effects in the third voice, but unfortunately Scorpio ran out of memory on the cartridge for it. 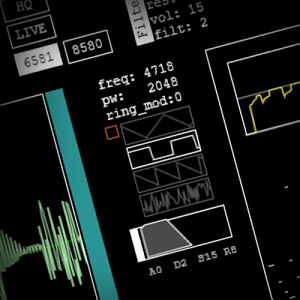 The player was forced to choose between music or sound effects, but not both. Another advertising game was produced in 1992. It was Harald Hårdtand for Colgate-Palmolive, the toothpaste company. It was a side-scrolling platform shooter next to giant teeth inside a mouth. Harald had to fight bacteria with his toothpaste gun, and it even had boss fights. A version for Amiga, C64 and PC was made, and this time Drax made all the music on C64. I converted it to AdLib on PC and made the sound effects. Jesper took care of the sound on the Amiga version. Niels’ friend Morten coded the Amiga version, Scorpio once again did the C64 version, and Kaare Siesing the PC version. I will get into details about this in a later chapter named after it. One of the odd things about working kind of freelance for SilverRock, producing music and sound effects, was the payment. For a long time most of us sound guys were just paid in various kinds of hardware. SilverRock saved some tax money buying it through the company and then passing it on to us. For the Super OsWald job, I received a 1.5 MB RAM expansion for my Amiga 500, which I was happy about at the time. The Hugo job in 1991 earned me a 33 MHz 80386 PC with an 89 MB hard disk. It was pretty much cutting edge at the time, and it immediately got me interested in the AdLib capabilities of the Sound Blaster card. In the later 90’s, we switched to contracts and they paid me actual money. The final Hugo job earned me enough money to pay the advance for my own apartment in 1995. That was the end of part 3. Click here for part 4. JCH, this reads incredibly well. I wouldn’t have expected that a C64 fame guy comes clean with his beginnings in such a straight manner. Everyone being recognized for his great artistic work must have gone through similar steps. Struggles, failures, weak creations, but eager to become better, thinking of oneself not being as good as others (always comparing)… at the end there’s no better, only “also good but in another way”. There are many composers good in their own ways and it’s a pleasure to listen to their works. They all are pieces of a mosaic which when being assembled result in creating the magic masterpiece itself, called music (oh how pathetic ;-). All the best for you!